The Lake Harvey project is 12.45 acres in size and is located at the Northwest corner of St Lucie West Boulevard and NW Cashmere Boulevard. The project site was purchased from Martin Memorial by the St Lucie West Services District for $4,410,000 in 2014 with the expressed objective of creating a wetland/surface water facility that would provide both water quality and water quantity enhancements to the overall St Lucie West surface water management system. The City of Port St. Lucie assisted by funding the purchase of the Martin Memorial property with a portion of the Stormwater Assessment Fees they collect in SLW they give the SLWSD 75% of the assessments generated in SLW and upon issuance of the 2014 Stormwater Bond the City committed an additional $400,000 a year for 15 years of the bond. 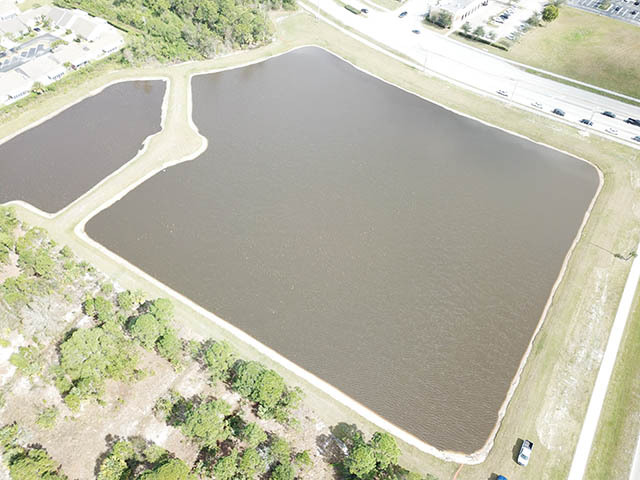 The project consists of approximately 2.3 acres of open water surface along the frontage of St Lucie West and NW Cashmere Boulevards with a 4.1 acres wetland area located to the north and west of the open water. The remainder of the property is made up of lake banks, perimeter, and upland buffers. Both the open water and wetland areas will provide additional storm water storage for the surface water management system and will enhance flood protection in high intensity storms, while the wetland component of the project will provide nutrient uptake for stormwater runoff within that area of the St Lucie West system. Drainage that currently flows west from the Martin Memorial site, as well as portions of St Lucie West Boulevard and the Lowes commercial center, will be allowed to flow into the new facility prior to discharging to the east through the NW Cashmere drainage system. No estimates of nutrient uptake have been prepared to date but it is expected that the water quality benefits realized by this project will be significant. The Lake Harvey project in conjunction with a recently completed canal project providing enhanced hydraulic connectivity in the northeast quadrant of the St. Lucie West Water Management System, is expected to reduce impacts of high-intensity storms in that area by more than 5 inches. Download the entire article about the Lake Harvey Project.